The injury bug has struck the UFC Fight Night 49 event that’s slated for August 23 in Tulsa, Oklahoma. Injuries to Demian Maia and Brandon Thatch have forced the changes on the card. 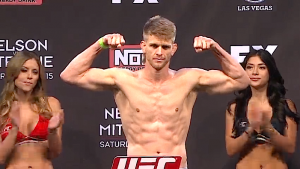 Maia was slated to take on Mike Pyle with Thatch taking on Jordan Mein. Now Mike Pyle will take on Jordan Mein in the co-main event slot. The event will take place at the BOK Center and will air on FOX Sports 1, headlined by the lightweight bout between former lightweight champion Ben Henderson and Rafael dos Anjos. Ever seen a guy headbutt and break a windshield on purpose?